Many have labeled the current era of television as the medium’s “second golden age.” But I believe rather than the ordered, rampant success that “golden age” implies, current television more accurately resembles a cinematic “Wild West” free-for-all. The number of different forms that TV shows can take is ever increasing; from network broadcasts to basic cable to Netflix streaming, we’re experiencing an influx of entertainment from all sides like never before. And whether the viewer cares or not, these forms are in direct competition, and already the streaming services and cable channels are hungrily approaching the throne for the most prevalent form of televised entertainment. While broadcast TV still averages high viewership and holds advantages over its challengers in its accessibility, the gap is closing and the control is shifting. As broadcast TV series enter the May sweeps, the need for shows to survive is perhaps secondary to the need for network television to survive against competing forms, which seemingly never stop trying to find ways to usurp it. The “sweeps” months for television, with May being the most important one of them, are when ratings for TV shows are tabulated in order to determine how much advertising, and for how much money, the series can receive. As such, the months are usually a staple for the highest quality entertainment from network television series—or, as viewers experience each year, the guise of quality. As sweeps month begins, television series will promote special episodes, bring in celebrity guest stars, and resolve climaxes in the series’ plots in order to ramp up viewership as much as possible. The result can often be a cheapening of quality of the rest of the season for these shows, which feature filler episodes so that writers can effectively kill time in between sweeps months. Not to mention the related, and perhaps more alarming, cheapening of the audience’s viewing experience. The integrity of plot and the honest quality of TV series are too often sacrificed in the name of bumping up advertising rates. It becomes frustrating to sit through several months of re-runs and half-hearted episodes only to see the drama of a series inorganically elevate for a couple of weeks a season. It also does not help the transition for a series onto Netflix, where binge-watchers have to trudge through episodes of drivel in order to see the plot move forward. This last consequence is also the most telling one; aside from all the statistics regarding convenience and money, the potential success of streaming services and basic cable is that they seem to take their viewers seriously where broadcast TV does not. Of course, the best network shows have yet to see the effects of competition bear much damage. Last year’s average viewership of The Big Bang Theory—CBS’ prized program—was 19.96 million viewers, whereas an average of 14.40 million viewers tuned in for the latest season of The Walking Dead—the current viewership champion of AMC and basic cable as a whole. 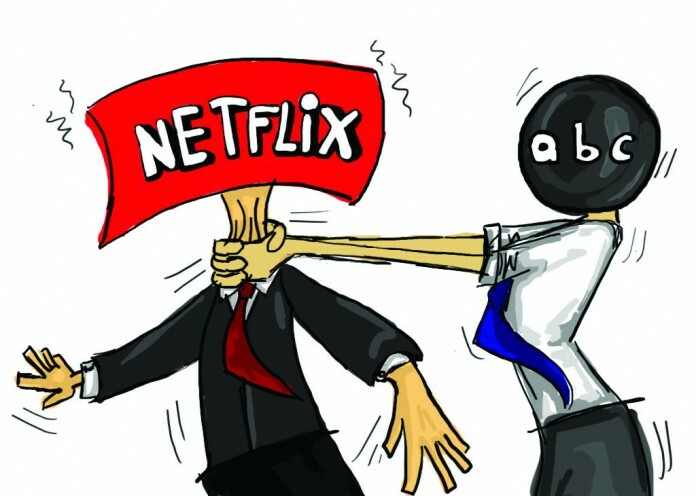 Not to mention that Netflix is taking its fair share of questioning and criticism: while no official numbers will be released for the viewership of series like House of Cards, the binge-watching model is too new to be safe from possibly becoming a novelty, and streaming series suffer from the absence of weekly, episode-by-episode coverage by media outlets that help build hype around individual episodes for viewers. Yet through its inherent and current empirical advantages, network TV series need to work harder. The advantage of Better Call Saul or Orange is the New Black is that both of their formats allow for them to simply put out television. The two series’ latest seasons were ten episodes and thirteen episodes respectively, whereas broadcast TV’s The Blacklist pumped out 22 episodes in its latest season, which isn’t even a particularly high number for broadcast series. The subsequent advantage is that cable and Netflix do not have to adhere to the tricks that broadcast series utilize (e.g. throwing in fillers and saving the big stuff for sweeps). And if this months’ network sweeps are good for anything, it’s to give a chance for broadcast series to put up a fight against smarter and sleeker forms of television.